I have been struggling to put my finger on exactly why it is that I loathe Owen Smith with such a visceral, burning, contemptuous rage. It’s neither healthy nor seemly – to the extent that I have nearly hit “send” on a few truly nasty social media comments which I would never normally make before finally regaining my composure and putting the iPhone safely out of reach. It’s as though someone carefully and methodically packaged absolutely everything that I hate about modern politics into the greasy, grinning form of one man and paraded him on the television news every day to raise my blood pressure. There’s the oleaginous, media trained (but not sufficiently that it looks convincingly natural and authentic) television persona. There’s the craven cowardice of pretending he is every bit as old-school socialist as Jeremy Corbyn in a pitiful attempt to peel off Corbyn’s voters when we all know that he is the Parliamentary Labour Party’s centrist mole. There’s the sanctimonious waffle about Saving Our Blessed NHS (genuflect) from privatisation, admittedly hardly unique to Owen Smith but particularly eyebrow-raising coming from the mouth of somebody with his past career and political track record. There’s the deliberately old-school typeface and stylistic theme employed by his campaign (see picture at the end, or his pitiful website), designed to evoke thoughts of 1970s and 1980s Labour when his campaign is the living embodiment of the PLP’s mission to suppress Corbyn’s throwback movement. And then there’s Brexit. Oh yes, and then there is Owen Smith’s incessant, petulant whining about Britain’s decision to leave the EU, his channelling of the metro-left’s howl of anguish at the thought of being separated from their beloved European Union and his declared intention to nullify the public’s vote using any means at his disposal. It took precisely 24 hours for Smith’s clean skin to be scarred by the stigmata of Blairism. He had worked as a consultant for ‘Big Pharma’. He had welcomed private sector involvement in the NHS. He had guardedly backed the Iraq War. His skill as a media performer was demonstrated on Wednesday, when he tried to boast of his pivotal role in the Northern Ireland peace process. When this John Terry-style glory-hunting fell flat, he tried to further embellish his credentials in international conflict resolution by announcing he would happily sit down for talks with Islamic State. Whereas most Labour politicians content themselves with waving the red flag, Smith opted to wave a black one. An hour later Corbyn’s camp issued a statement distancing themselves from his stance, leaving Smith the only person in British political history to be outflanked by Jeremy Corbyn on the issue of national security. As a master-plan for wooing Corbyn’s supporters into his warm and pragmatic arms, it was utterly brilliant. Except it had one fatal flaw: It was so childishly transparent and craven, every Corbyn supporter in the land knew it was his master-plan. A weak plan from a weak and utterly forgettable man. In a decade’s time, nobody will remember who Owen Smith is. He will have returned to some anonymous career as a lobbyist or PR man, and will have a footnote in history as somebody who once caused minor irritation to Jeremy Corbyn for a few months. The Parliamentary Labour Party could of course have put forward someone with more gravitas and prime ministerial potential, but they didn’t. To a man and woman, they prized their own political careers over the opportunity to lead Labour to likely defeat in 2020. In many ways, Owen Smith is the collective cowardice of Labour’s remaining big beasts, given human form and a uniquely irritating grin. And Hodges is absolutely right – the bait and switch move that Owen Smith is trying to pull would be obvious to a ten-year-old. The 1970s font and protestations that he agrees with Corbyn on policy isn’t fooling anyone. He is treating Labour Party members with open contempt by even asking them to swallow his ruse, and I have no doubt that he will catastrophically underperform even the rock-bottom expectations of the Westminster political class when the results of the Labour leadership contest are announced. Ultimately, my problem with Owen Smith is this: now that Corbynism has been unleashed within the Labour Party, it can only be comprehensively tackled and beaten back through defeat at the ballot box in a general election. Anything else – whether it is forcing Corbyn to resign, shenanigans to set up a shadow “party within a party”, disenfranchising his supporters within the party or changing the rules to thwart him – will be insufficient. It may succeed in removing Corbyn, but Corbynism will live – his supporters will be enraged and his successor will have almost zero scope to change direction without seeing the bottom fall out of the Labour Party at the grassroots level, effectively destroying the party. By contrast, if Jeremy Corbyn is permitted to unapologetically lead Labour to a landslide defeat in 2020, then the centrists have a much fairer shot at regaining control of the party. Corbynism will be discredited and rejected by the British people, and the opening for an alternative will again exist. Owen Smith represents the Parliamentary Labour Party’s craven, ill-considered plan to try to circumvent that process. 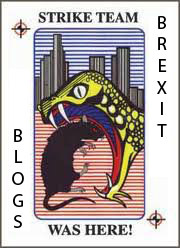 For reasons that this blog has previously explained – primarily impatience to return to power for the sake of their own political careers – a 2020 defeat and potential 2025 victory is simply too long to wait for a bunch of oily careerists who didn’t lead blandly forgettable lives and forego careers in the banking sector only to rot away, as they see it, on the backbenches. And so unwilling to even give Corbynism a chance to fail on its own, the restive PLP has decided to try to reassert their control now. But it won’t work. No political party can long endure when its elected representatives are so markedly at odds with the grassroots membership, the ordinary people who knock on doors and hand out leaflets to get their MPs elected in the first place. And Owen Smith’s candidacy represents a giant two-finger salute, fifty feet high and covered in glitter, directed at Labour Party members who strongly support Jeremy Corbyn. There’s a great episode of The West Wing where two of President Bartlet’s aides, Communications Director Toby Ziegler and Deputy Chief of Staff Josh Lyman, are left behind by the presidential motorcade during an election campaign stop and have to hitchhike their way back to Washington D.C. The two men begin to get on one another’s nerves as the ideological Toby Ziegler demands to know why the politically calculating Josh Lyman isn’t more enthusiastic about the president’s barnstorming stump speech, in which Bartlet aggressively criticises his Republican opponent. I’ve always thought that this is an important distinction, one which I try to apply in my own political thinking. Far nobler it is to want to win, to convince others of the rightness of one’s cause, than to want to beat the other side and take enjoyment as they suffer the bitter pangs of defeat. During the EU referendum, I genuinely wanted the Leave campaign to win more than I wanted to defeat the Remain campaign. Despite immense provocation from the political establishment and many on the Remain side, I was generally motivated more by a desire to secure a better and more democratic future for my country than to make Remainers sad or to wipe the smug smile off George Osborne’s face (though that has certainly been a wonderful bonus). Not so with this Labour leadership election though. I want Owen Smith to lose. I want him to lose big, and lose hard. I want him to suffer such a humiliating, lopsided, landslide defeat that he bursts into tears on live television and has to run from the conference hall in shame and ignominy. And I want the Parliamentary Labour Party, who cynically used the shocked aftermath of the EU referendum as a pretext to launch an antidemocratic coup against their elected leader and their own members, to behold this gruesome scene and take their lesson from it. I’m not proud of it, but that’s what this despicable, oleaginous, ideologically rootless C-list politician does to me. The sooner British political life is rid of him, the better. Can I Get A Prescription For My Chronic Europhobia On The NHS? When will they invent a cure for euroscepticism? Well, it’s official. Caring about democracy, taking an interest in how we choose to govern ourselves and thinking like an engaged citizen rather than a terrified consumer are symptoms of madness, or a highly contagious disease of some kind. Boris Johnson is mayor of the world’s greatest capital city. He is currently the bookies favourite to be next prime minister of the United Kingdom. And yet the madness has claimed him too. As it must claim anyone who signs up to the Out campaign’s cause. Because insanity is not a by-product of the Out campaign. It is at the core of its offer. For Out to win they know they must first destroy reason. They must convince a majority of mature, rational British adults that we should withdraw from our largest, most profitable trading block just at the very moment the world is teetering on the brink of another global recession. They know they must convince them of the wisdom of turning our back on our most important diplomatic partnerships just as Vladimir Putin is casting his malign eye westwards. They know they must convince them the Britain should attempt to face – in isolation – the most significant refugee crisis and terror threat since the war. And so to do that, they are trying to spread the contagion. Not though rational argument. No[t], actually, through fear. But simply by trying to drag an entire nation through the looking glass. To convince us all to see the same upside down world they see whenever the hear the name “Europe”. This is what this debate is doing to otherwise sane, intelligent people. It is literally making them incapable of confronting the realities of the world we face in 2016. They are being forced to flee through time, back to the windswept beaches of France, or the dusty hilltop forts of the Raj. And there, huddled round their camp fires, belting out another lusty rendition the Eton Boating song, they will lose. The voters are hardly enamoured of Europe. They are concerned by immigration, and creeping ECHR restrictions. They have a healthy lack of respect for Euro officialdom. A few still hanker for a prawn cocktail crisp. But they look at the Out campaign, and they know. They look at those advocating withdrawal, and they can sense it. An inflection in the voice. A glint in the eye. They can see they are afflicted with The Fever. Soon it will be over. Britain will vote. Britain will vote to remain In the European Union. And then, hopefully, our friends will be returned to us. I’m going to do something I almost never do, and let this one pass without comment. Because although I profoundly disagree with Dan’s view of Brexit, when it comes to the way the major Leave campaigns jostling for official designation are conducting themselves, there is absolutely nothing I can say in their defence. It is hard to fight back against the trope that dissenting from European political union by stealth is equivalent to the pathology of “Europhobia” when some people – either losing sight of the grand prize or never having understood it in the first place – are determined to live up to their own worst stereotypes. One quick suggestion, though. If we are indeed to remain “friends” once this bitterly contested referendum is over, it might be wise for those on the Remain side to stop pathologising their opponents. Why Does Britain No Longer Care Much About Refugees? Dan Hodges has a reflective and rather wistful column in yesterday’s Telegraph, in which he says that people who pride themselves on their progressive values must accept that they have lost the argument, and that Britain will not make a more meaningful contribution in terms of accepting a number of Syrian asylum seekers more in line with many of our European neighbours. There is no longer an argument to be had about whether or not significant numbers of refugees should be admitted to the UK. The pendulum of empathy – which swung briefly following thepublication of photos of little Alan Kurdi lying motionless on that Turkish beach – has swung back. The clashes at the Hungarian-Serbian border. The Paris attacks. Cologne. They are shaping public opinion now. And it will not be reshaped. [..] There is no longer any point in expending energy on morally comforting tokenism. The argument about whether to accept 3,000 refugee children from Europe, or whether to accept them from camps within region, is as relevant to the crisis we – or more importantly, they – are facing as debating whether to accept 3,000 refugee children from Mars. According to the latest figures from the UNHCR, there are 4,597,436 registered Syrian refugees. 39 per cent of them are under the age of 11. A further 13 per cent are between the ages of 12 and 17. To continue to use the children of Syria in a proxy argument over our willingness to “do our bit” is not an exercise in compassion but an exercise in grotesque self-indulgence. There is also no longer any point attempting to delude ourselves the solution to the Syrian refugee crisis can be found in Europe. Yes, we have the resources to provide sanctuary. But we do not have the political will to provide sanctuary. Actually, blaming the politicians on this one is a cop out. We do not have the public will to provide sanctuary. Hodges is right that there is simply no longer any public will to take in poor, tired, huddled masses trying to escape from civil war and the particularly murderous theocracy of ISIS. And his notion of a “pendulum of empathy” is powerful and accurate way of describing what has happened to public opinion here. But why is this the case? Why has the pendulum swung so hard away from generosity and toward selfishness? While Dan Hodges’ piece is eminently pragmatic in its acknowledgement of failure and suggestions for a feasible way forward, it fails to ask why we are where we are – why British hearts are so hardened to the idea of welcoming many thousands more refugees. 1. The line between refugee and economic migrant has become almost impossibly blurred in our globalised age of jet travel and smartphones. People living in benighted parts of the world know better than ever just how good we have it in prosperous countries like Britain, and it is easier than ever before (though still perilous for some) for many to travel here – and ever more tempting compared to the life of hardship and drudgery facing them at home if they stay. But where do you possibly draw the line between economic migrant and refugee? If being in a country engaged in civil war is sufficient qualification then all 22 million Syrian citizens would be entitled to refuge in Europe, and those of other countries too. But this would be quite unfeasible. Besides the impossibility of emptying a country of its every last non-combatant whenever hostilities break out, it ignores the vital agency that at lease some of these citizens must have in fighting for their own freedoms and liberties. So if not all citizens, how do you choose among those who have risked their lives to reach safety, often with little or no paperwork or proof that they have a particular fear of persecution or harm to distinguish them from any other. I simply don’t see a way that any such process can be anything other than arbitrary, endlessly bureaucratic and cruel. Add to this the fact that accepting people blindly on a first-come, first-served basis is untenable and creates serious potential national security issues, and the current paralysis is quite understandable, if no less frustrating. 2. Britain has accepted hundreds of thousands of new arrivals through legal immigration routes, particularly from some of the A10 countries which joined the European Union in 2004. And we did so while any talk about the potential impact that this relatively huge wave of immigration might have on community cohesion, housing or public services was instantly dismissed by scornful elites as xenophobic tub thumping at best, or outright racism at worse. Prior to the rise of UKIP as a legitimate, non-extreme outlet for these concerns, nobody in the establishment was talking about this issue, and the ground was ceded to the likes of the extremist BNP. There was effectively a conspiracy of silence and intimidation against those who questioned the extent of immigration into Britain, with those in power doing nothing to respond meaningfully to public concerns partly because the political class were fortunate enough to belong to the group which disproportionately benefits from immigration and sees only its positive aspects, while other less fortunate people – often those without university degrees and less economic security – were far more likely to feel the negative consequences. You don’t have to be an opponent of immigration to abhor the undemocratic way that these transformational changes were foisted on Britain by stealth, and without a thought of engaging with the people to consult their views. Indeed, this blog greatly favours immigration, but believes that the negative consequences are real, and can only be mitigated if the process of deciding immigration policy is open, transparent and democratic. But Britain’s immigration policy is none of these things, and one of the consequences of an aloof, disengaged and elitist policy is always going to be massive popular resentment and opposition to those same policies. Therefore, if we are looking to cast blame or understand why Britain is behaving so apparently harshly in the face of this current humanitarian disaster, should we not first look to the historic cheerleaders of unlimited immigration – the pro EU fanatics, New Labour architects, those who held national power in the 2000s and the virtue-signalling middle class clerisy who flaunted their enlightened credentials by attacking anybody who expressed doubt about what was happening? Now people will say that it is unfair to conflate immigration and asylum, as the two are quite separate things. And they would be correct – they are separate, and it is unfair. But both economic migration and taking in asylum seekers involve adding to the population and increasing the burden on services and infrastructure which cannot greatly expand to match demand in the short to medium term. And when you sorely abuse the public’s willingness to accommodate one influx of people, they are naturally far more guarded and hostile when it comes to the next, different influx. If Britain did not have a completely open door to all regional immigration – unheard of in any major country outside Europe – could we have managed the influx of people wanting to work and settle here in a more planned and measured way, and with a modicum of democratic consent from the people? Arguably, yes. And if Britain had not seen 1.4 million economic migrants settle here from EU accession countries within just the last fifteen years, would there be more willingness now to accept many more refugees in desperate need? Again, arguably, yes. At least Dan Hodges and the progressive Left would now have had a much clearer grievance if Britain then still failed to admit a larger number of refugees. They would be able to accuse the government and the country of barely concealed racism, and of acting selfishly when nothing had been asked of them before, and do so with real justification. But we do not live in that alternate reality. We live in the real world, where Dan Hodges and the europhiles got everything they wanted year after year, with Britain’s borders fully open and anyone who complained swiftly painted as a xenophobic Little Englander and banished from respectable society. And so in 2016, unfortunately it is the desperate refugees – rather than the virtue-signalling progressive Left – who are now paying the price of this arrogant folly. After four long days, Jeremy Corbyn’s so-called “revenge reshuffle” is finally complete, the whole exercise resembling nothing so much as a tedious game of musical chairs played by a group of largely forgettable and unexceptional B and C-list politicians. However, perhaps Jeremy Corbyn should not call an end to his shuffling just yet, given the fact that some notably less-than-loyal courtiers inexplicably remain in their posts. Watson sees it as his mission to keep the Labour Party together. But everyone knows that is mission impossible. Labour is heading for all-out civil war, and there is nothing Tom Watson or anyone else can do to stop it. To the mind of this Labour MP, serving in Jeremy Corbyn’s shadow cabinet, Corbynism is “part of the problem”. Imagine for a moment what outrage there would have been if, just months into Ed Miliband’s disastrous tenure as Labour leader, a shadow cabinet member had said that Milibandism was part of the problem and something to be undermined from within. Imagine what everyone would be saying about the rank cowardice of that shadow cabinet minister, who disagreed with everything that their leader believes in but who lacked the courage to forsake their position and say so publicly. Jeremy Corbyn’s reshuffle has only just been completed, and already a shadow cabinet minister has given this juicy morsel of a quote to Dan Hodges. Truly, the Labour Party seems to have a death wish, preferring to go down in a blaze of whining, sanctimonious victimhood rather than tough out a few dry years in the political wilderness. Yes, of course both sides are at fault, although I would side with the Corbyn team’s bumbling ineptitude over the calculating self-interest of the moderates-in-exile every time. But one thing is certain: it will be impossible to keep the Labour Party together so long as shadow cabinet members are making such toxic briefings against their own leader immediately after having been re-confirmed in their own jobs. Here we are again, confronted with yet another anonymous Labour “heavyweight” with the duplicity to profess loyalty to Jeremy Corbyn’s face and then run straight to sympathetic journalists the very same day with tear-jerking stories about how the Labour leader hurt their pwecious feewings. Will they muster the courage to say to Jeremy Corbyn’s face what they so gladly regale to the Telegraph? Of course not. Because for them it is not about principle, or honour, or doing what is best for the Labour Party – despite their earnest protestations the the contrary. If his detractors truly believe Jeremy Corbyn to be as terrible as they continually tell Dan Hodges he is, they have a moral duty – over and above any consideration for their own careers – to rise up and depose him immediately, just as those people who call the present government “evil” should be launching an insurrection on the streets of London rather than posting preening, overwrought status updates on Facebook. But just as those angry keyboard warriors who accuse the Evil Tories of supposed human rights abuses will astonishingly not be found storming the gates of Downing Street in morally justified insurrection, neither will Jeremy Corbyn’s shadow cabinet detractors be spotted collecting signatures of fellow MPs in a serious attempt to oust their despised leader. No, instead they will be found moping into a pint glass at a dark Westminster drinking hole, spilling their sorry guts to Dan Hodges. What bravery. What principle. What courageous heroism is this? I would understand the incessant carping and undermining of Jeremy Corbyn from within the Labour Party if there were some other great and noble faction vying for supremacy and influence – if some other, unfairly marginalised figure within Labour had a cunning plan to offer the electorate something different and reinvent the party for the twenty-first century. But there quite evidently is no such group or individual waiting in the wings with a burning vision for Britain. On the contrary, instead of a King Across The Water waiting to reclaim their rightful throne, there is only the same ragtag assortment of fading New Labour machine politicians and grasping, telegenic SpAdocrats who so repulsed the voters last time round that it led to the election of Jeremy Corbyn in the first place. This is why I balk at those malcontents within Labour who simply cannot stop themselves running to the media with salacious court gossip and bitter invective about their leader, seeking to undermine Jeremy Corbyn’s leadership at every turn. What is their bright alternative? What radical new platform will win back Scotland, inspire Middle England or turf out an uninspiring but power-hungry Conservative Party whose grasping, centrist tentacles are well on their way to establish a hegemonic lock on the levers of power for the next decade? Exactly. The malcontents have nothing. Tumbleweeds. Is Jeremy Corbyn going to win the 2020 general election and become the next prime minister of the United Kingdom? Almost certainly not. But guess what? Neither will Andy Burnham, Yvette Cooper, Chuka Umunna, Dan Jarvis, Stella Creasy, Gloria De Piero, Luciana Berger, Hillary Benn, the Eagle sisters or Lisa Nandy. Neither the Labour front bench nor their back benches are brimming over with immediately obvious future prime minister material. With the Labour Party already at such a low ebb, is a few years of Jeremy Corbyn’s red-blooded socialism really likely to do more damage than an Ed Miliband Mark II? Hardly. So in the absence of anything – anything at all – resembling a more appealing prospect, why not spend the next eighteen months trying something new and letting the Corbynites have a turn? But the malcontents just can’t do it. They might not have the first inkling of what they want instead of Corbyn – let alone what the voters might want. All the plotting moderates know for sure is that they have been suddenly and unexpectedly turfed out of power and influence within the Labour Party. And it is just eating them up inside. There is no violin small enough to play in mournful solidarity with these hapless centrists – Labour MPs whose only fixed and immovable belief was the desire to wield power and influence, shamelessly trading on the storied name of their party while peddling the same soul-sapping centrist consensus as nearly everyone else in Westminster. May their richly deserved time in the wilderness be long and harsh. May they suffer and roar together. Jeremy Corbyn’s restive but cowardly shadow cabinet members have refused to put up or shut up with their concerns about his leadership. Therefore, he should fire them. Now. Rumour has it that Jeremy Corbyn had finally had enough of spineless Labour shadow cabinet members who choose to serve under him by day but run to the newspapers with sensationalist quotes attacking him by night. Jeremy Corbyn will spend the Christmas break planning a reshuffle to oust his most prominent shadow cabinet critics that is due to be announced within weeks of the New Year, The Telegraph understands. The Labour leader and his aides will spend the next fortnight working out how to replace leading internal critics with allies in major a departure from his initial conciliatory top team. Hilary Benn, the shadow foreign secretary, and Maria Eagle, the shadow defence secretary, are high on the target list after their public opposition to Mr Corbyn over Syrian air strikes. Good. A reshuffle is long overdue. Let us not forget that it is the restive Labour centrists currently murmuring and plotting within Jeremy Corbyn’s shadow cabinet who are responsible for his rise – and the rise of the hard left in general – in the first place. Hopelessly pathetic Labour leadership candidates like Andy Burnham and Yvette Cooper inspired such little inspiration among the party grassroots with their centrist non-vision that Corbyn, an unreconstructed socialist, won the leadership contest by a landslide. And for the past five years of Conservative coalition rule, the Labour centrists – working under Ed Miliband – engaged in a hysterical, sanctimoniously moralising form of opposition which tolerated the most ridiculous anti-Tory hyperbole in the pursuit of power. This approach – incorporating such tactics as ranting about the supposed “human rights” abuses of the Evil Tories – gave a green light to the crazies and far-left types who have now taken control. The centrists tried to ride the far-left tiger, but were eaten by it. And yet these losers – these Labour centrists who could barely motivate their own families to vote for them – have the temerity to mutter their discontent to the national newspapers, even while serving in Jeremy Corbyn’s shadow cabinet and being loyal to his face. This is the dilemma facing Labour MPs after ‘Suicide Saturday’. The size of Jeremy Corbyn’s victory makes it impossible to mount an immediate challenge. But his reaction at the moment of his victory reinforced the impression he cannot be left to lead his party for an extended period. “We can’t wait five years”, one shadow minister said. “Two years at the maximum”. One shadow cabinet minister has warned of a potential wave of “punishment beatings” being meted out to those MPs who do not show their new leader and his supporters the appropriate degree of respect. If even one of these quotes had been made by a restive shadow cabinet member about Ed Miliband, such brazen disrespect for the office of Leader would have been front page news, and news channels would have led with stories about an imminent resignation from the Labour front bench. But under Corbyn’s leadership, the normal rules of behaviour have been suspended – Corbyn’s shadow cabinet feel free to brief against him every day without doing the decent thing and resigning, and the spectacle has become so unremarkable that each instance serves only to add colour to other news stories, rather than making headlines on their own. Mass shadow cabinet resignations. A dramatic stalking-horse challenge. Poor-health. An act of God. The bulk of the PLP yearns for anything that will bring an end to their Corbyn nightmare. Anything, that is, that does not require an act of courage or defiance from themselves. And these people actually aspire to govern us. They have the nerve to represent themselves as our future leaders. Ask us to place in their trembling, fumbling hands decisions of life and death, health and happiness, war and peace. They will not get their wish. There is no 100,000 strong army of “moderates” riding to their rescue. Good. Labour’s spineless parliamentarians no longer deserve salvation. The current situation is quite simply untenable. The Labour centrists lost the general election, the Labour leadership election and the argument. They lost. They utterly failed to present a compelling political vision of their own, and so they were turfed out in favour of the Corbynites, who do actually stand for something (however unappealing that vision may be). Jeremy Corbyn’s shadow cabinet are duty bound to serve the man who won their party’s leadership election. That’s how it works. If they have irreconcilable differences with Corbyn on fundamental matters of policy or leadership style, they should air their dissent from the backbenches after having resigned on principle, and not continue to moan and whimper while clinging on to their thoroughly unremarkable front bench careers. So I say bring on the Corbyn cabinet reshuffle. Those who brief anonymously to the newspapers but lack the courage to air their grievances directly do not deserve their positions of seniority. May many cowardly heads roll this Christmas.